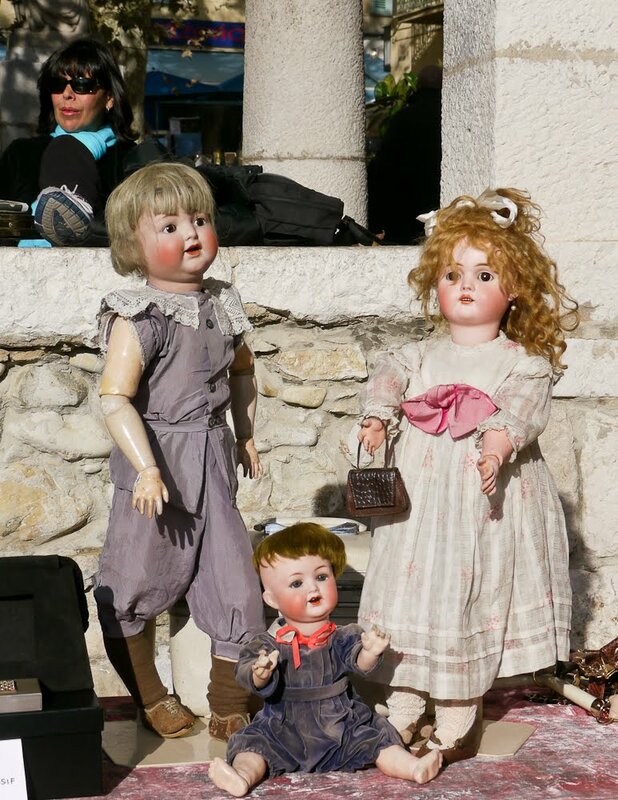 Menton's flea market: how about a doll for Christmas? La brocante hebdomadaire de Menton: que diriez-vous d'une poupée pour Noël? Funny comment, Birdman! I find those dolls very appealing. I have a grandchild bedroom in my house and one cabinet has 10 dolls arranged along the top for granddaughter Olivia, who pays no attention to them. I would have loved them, but I guess she's a bit different. But, there are some beauties that I got at a garage sale from a collector! Guess I'm the collector now! Dolls can be very scary. I have always treasured my dolls!!! This post reminds me of an old collection of Lavin dolls. Very nostalgia inflicting here. Oh, how I love the dolls of Menton. How about the one with black sunglasses in the back? Yes, that was the point. I nearly put 4 dolls but thought I'd better not! I find these dolls freaky! LOL Jilly, it would have been a fun title.